Construction on the new Crook County Jail hit a bit of lull this winter, but work has resumed and should continue through the coming year. "They are getting ready to start doing the stem walls," said Crook County Sheriff John Gautney. "Once they get the stem walls in, the next step is pouring the slab for the flooring." Construction of the new 76-bed, $17 million jail began toward the end of August with contracting company Kirby Nagelhout leading the effort. Construction of the new facility, long-awaited by residents and local leaders who grew frustrated by lacking jail space, was made a reality with the passage of a tax bond in late 2016. 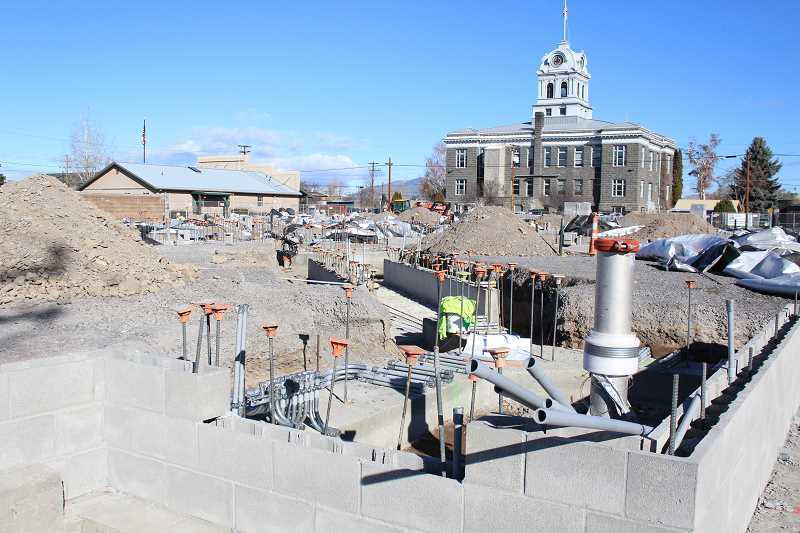 In addition to the stem wall and foundation work, concrete will be poured for the breezeway that will connect the jail to the sheriff's office, which is just to the west of the site. Gautney said the concrete steps leading out of the east end of his office were recently removed. As this past December approached, the expectation was that people would start to see the walls of the new jail start going up, but the project was delayed by design changes made to keep the project within budget. "We had to go through and do some more value engineering," explained Crook County Commissioner Brian Barney, who serves as the liaison for county law enforcement. He explained that the original design, which was completed by DLR Group, included some higher-end items and because prices for building materials have increased, the inclusion of those items pushed the project out of budget. "We had to eliminate dozens of skylights that were very expensive and do the basics that were necessary to provide a little sunlight," Barney said. Citing another example, Barney said some plumbing designs that featured multiple temperatures for hot water were redrawn, scaling back to a single temperature. "Some of the glitter and glamour was taken off of it," he said. "It is still going to be a very nice jail." Gautney said the changes took some time to figure out, but county officials recently arrived at a design and cost that fit the established budget. "The county signed off on it," he said. "Now it is just building time." Facing bumps in the process is not a new thing for county government and law enforcement officials. This past fall, the county learned that the soil beneath the jail site would not support the structure without the addition of roughly 800 Geopiers. Gautney explained that workers had to drive a hollow tube about 25 feet into the ground, then back the tube out a foot, and fill that emptied portion with gravel. Workers then compact the gravel, causing it to mushroom out and stabilize the area around it. That process is then repeated until the 25-foot section is completely filled and compacted. That change of plans did not affect the estimated completion date of the jail, which had an initial finish date of December 2018. However, the recent changes to design has pushed that end date back to April 2019. "We are still moving forward," Gautney said. "There was a little lull there, but now that we are moving forward. We should see some stuff getting done in the next few days." And barring any further complications, people should soon see the project get vertical. "As soon as they get the stem walls in and the foundation poured, you will see the walls going up," Gautney said.